NANTEL, ANTONIN, Roman Catholic priest, teacher, school administrator, and author; b. 17 Sept. 1839 in Saint-Jérôme, Lower Canada, son of Guillaume Nantel, a tanner, and Adélaïde Desjardins; d. 30 July 1929 in Sainte-Thérèse-de-Blainville (Sainte-Thérèse), Que. In 1851, at the age of 12, Antonin Nantel entered the Petit Séminaire de Sainte-Thérèse, where he would spend virtually all his life. When he was in his sixth year (Rhetoric), his father died. Antonin began to study theology in 1859 and was ordained priest in 1862. That year he joined the faculty of the institution where he had been educated and set up within it the Académie Saint-Charles, named in honour of Charles-Joseph Ducharme*, who had founded the Petit Séminaire. The academy invited the most gifted students of literature to develop their potential through the humanities. By 1863 Nantel had become prefect of studies in the seminary. He published pedagogical writings in the Montreal Revue canadienne, and would contribute other articles to La Semaine religieuse de Montréal. His Nouveau cours de langue anglaise selon la méthode d’Ollendorff à l’usage des écoles, académies, pensionnats et collèges, which he brought out in Montreal, probably in 1864, would go through several editions. 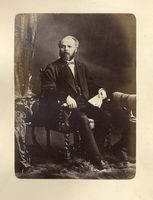 His younger brothers Guillaume-Alphonse* and Wilfrid-Bruno*, who were both to have prominent political careers in the Conservative party, also attended the Petit Séminaire de Sainte-Thérèse. A short man who had an authoritarian personality, Nantel had a vast store of knowledge and his orderly and methodical habits marked him for high office. It was no surprise when he became superior of the Petit Séminaire de Sainte-Thérèse in 1870. 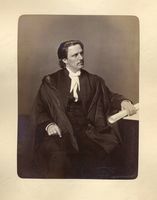 A tireless worker, he kept a tight rein on instruction by retaining the office of prefect of studies (until 1873 and again from 1879 to 1883), by continuing to teach courses in literature, history, and English, and by serving as director of the Académie Saint-Charles. In 1880 Nantel founded the Annales térésiennes, the seminary’s official organ, which would be published until 1946. This periodical reflected the manifestly Christian vision of things by which Nantel judged all manner of events, the better to instruct his flock about them. He also wrote textbooks, some of which would be accepted as authoritative in educational establishments. In 1881 the college was destroyed by fire. Thanks to the wide support Nantel enjoyed in various influential circles in which many of his former colleagues and students participated, a new building opened in 1883. Nantel would be the seminary’s superior until 1886, from 1889 to 1895, and again from 1900 to 1905. At first glance, Nantel’s view of education was a conservative one. He believed in the virtues of classical studies, and wanted to make his students leaders, but even more, convinced Christians and patriots. In 1874 he had accepted the ideas of Pierre-Auguste Leroy* with some enthusiasm. 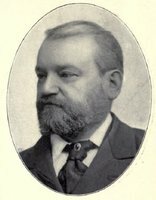 Interested in promoting school reform, Leroy criticized the classical courses for, among other things, not taking pupils’ aptitudes into account and for putting too much emphasis on memorization. He recommended that the time devoted to the teaching of Greek and Latin be cut in half, in favour of practical subjects. While not accepting his condemnation of instruction of classical languages, Nantel introduced a program of commercial studies at the Petit Séminaire de Sainte-Thérèse. Nantel held views similar to those of Joseph-Adolphe Chapleau* and the curé François-Xavier-Antoine Labelle* concerning the social and economic development taking place in northern Quebec. Nantel and Labelle’s paths had crossed while they were students at the Petit Séminaire de Sainte-Thérèse and they had become friends in the 1870s. Their warm relationship was based partly on their priestly vocation and attachment to their alma mater, but also on their common desire to contribute to the progress of the north, the advancement of settlers, and the training of leaders. Nantel never missed an opportunity to praise Labelle’s work as a colonizer. In 1882, along with his brothers Guillaume-Alphonse and Wilfrid-Bruno, he even founded a colony in Nominingue, where two other Nantel brothers, Jules and Maximien, settled with their families. The essense of Nantel’s political thinking is conveyed in the speech he gave at the celebration organized to mark the consecration of the new college in 1883. “What the church blesses and consecrates, the state respects and protects,” he said. Although he was an ultramontane, he did not identify with the “Castors”; he thought that cooperation between church and state gave the latter an area free of clerical intervention. In fact, he believed the state should leave the management of education to the church. In view of the excellence of the elite trained in educational institutions entrusted to the care of religious communities, the state had never, in his opinion, had cause to regret such a division of powers. In all other matters, the superior of the Petit Séminaire de Sainte-Thérèse relied on the leadership of politicians. By family tradition, by temperament, and clearly by reason of his ecclesiastical status, Nantel’s sympathies lay with the Conservative party. In 1872 he corresponded with Louis-Rodrigue Masson*. Like Labelle, however, he was closer to Chapleau; the latter, after his election by acclamation as the mla for Terrebonne on 12 March 1873, went with Premier Gédéon Ouimet* to Sainte-Thérèse-de-Blainville, where he was warmly received. Chapleau had great admiration for Nantel. For example, when the creation of a bishopric in Saint-Jérôme was under consideration in 1897, Chapleau, who was then lieutenant governor of Quebec, would propose Nantel as an ideal candidate for the mitre. Nantel’s discreet political influence, while not as great as Labelle’s, had nevertheless been significant. However, the superior of the Petit Séminaire had left participation in party politics to his brothers. Throughout his life, Nantel had been interested in literature and history. In 1868 he had become a member of the Société Historique de Montréal. The following year, he had published in Montreal Les fleurs de la poésie canadienne. In 1877, according to Séraphin Marion*, he was invited to become a member of the Société Littéraire du Canada. In 1905, after completing his final term as superior of the Petit Séminaire, Nantel at the age of 66 set out for France to do further research. He returned to Canada in 1908, having published a scholarly work in Paris that year under the pseudonym of A. Berloin: La parole humaine: études de philologie nouvelle d’après une langue d’Amérique. Devoted mainly to the “language of the Algic tribes,” this work was reviewed, for the most part favourably, in a number of newspapers. Abbé Camille Roy*, the future rector of the Université Laval, wrote one of the reviews. Jointly with Benjamin Sulte, Nantel became the senior member of the Société Historique de Montréal in 1919. He was made a Roman prelate in 1923 and received an honorary doctorate of letters from the Université de Montréal the following year. He died at the venerable age of 89. Antonin Nantel was renowned as a man of letters, but even more as a pedagogue. His writings, especially La parole humaine, impressed his contemporaries, yet they soon became dated because they were first and above all for instructional purposes. His work as an educator, on the other hand, left a lasting mark. Although a staunch supporter of classical education based on Christianity, Nantel unhesitatingly adapted his college’s curricula to the needs of the developing industrial society, as his introduction of commercial studies and emphasis on the teaching of English show. It was, however, in shaping the future of the Petit Séminaire de Sainte-Thérèse over the greater part of his career that he made his principal contribution to the world of education. He is referred to as the second founder of that institution, which for many years had been the alma mater of much of the elite in the Laurentian region. Despite extensive searching, Antonin Nantel’s baptismal certificate could not be found. The reader will find articles by Nantel – extracts from the Annales térésiennes and from various newspapers and magazines – in his Pages historiques et littéraires (Montréal, 1928). Several of Nantel’s works are mentioned in the biography; for a more complete list, see Hamel et al., DALFAN, 1022. Le Devoir, 31 juill., 9 août 1929. L.-P. Audet, “Le Québec à l’Exposition internationale de Paris en 1878,” Cahiers des Dix, 32 (1967): 125-55. DOLQ, vol.1. Serge Laurin, Rouge, Bleu: la saga des Prévost et des Nantel: chronique d’un siècle d’histoire politique dans la région des Laurentides (Sainte-Foy, Qué., 1999). Séraphin Marion, “Origines de l’Institut canadien-français d’Ottawa et de la Société royale du Canada,” Cahiers des Dix, 39 (1974): 45-84. Serge Laurin, “NANTEL, ANTONIN,” in Dictionary of Canadian Biography, vol. 15, University of Toronto/Université Laval, 2003–, accessed April 20, 2019, http://www.biographi.ca/en/bio/nantel_antonin_15E.html.